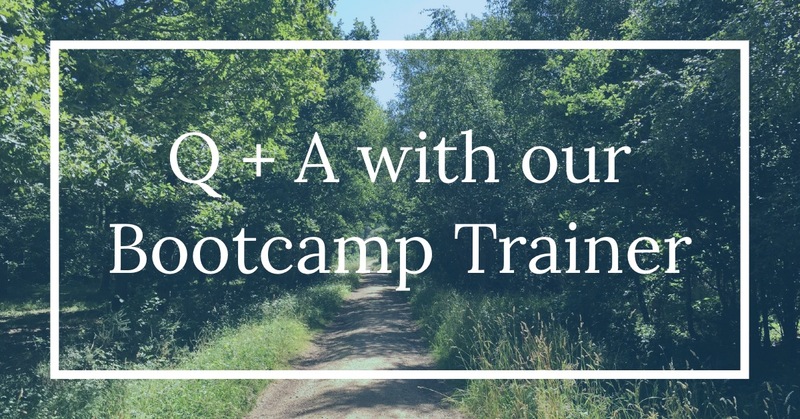 We’ve caught up with our Glamping Bootcamp trainer, Caitlin to find out her responses/opinion on the most popular questions regarding exercise and nutrition today. Check them out below and let us know if you found them helpful! Why do you love exercise? Exercise boosts my mood and energy levels almost instantly. I enjoy challenging and moving my body, improving my health and capabilities gradually overtime. I love that powerful feeling of being strong and invincible during and after smashing a good workout, you can’t beat it in my opinion! What would be the one tip you use to keep clients, or yourself, motivated to continue a workout? Music plays a massive part with motivation during any workout. However having a good, positive mind set is key! If you go into a workout thinking I can’t do this, I don’t want to be here etc it’s likely you won’t push yourself as hard or have a very productive session. As a trainer I like to motivate my clients with positive encouragement, helping them believe in themselves and above all enjoy the workout. My personal fitness journey has driven my career into the fitness industry.Whilst growing up I loved sports and was generally very active, however once hitting college and university my levels of activity/exercise dropped massively with living away from home, buying and cooking my own meals etc. Of course with the change of lifestyle I started to gain weight. 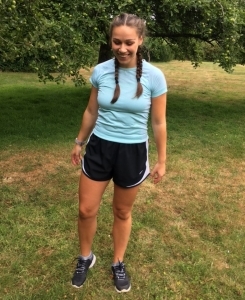 I found the gym an extremely daunting and uncomfortable place however I forced myself into a crazy gym routine, crash diets you name it and eventually ended up having a very negative relationship with my body, food and exercise. Over the years I have experienced first-hand the highs and lows of exercise and diets. I am now finally reaching a point where I love food, exercise and my body and enjoy sharing and helping others with my knowledge and past experience. I want to provide a service I wish I had access to when I was 18 years old and struggling with weight, body confidence and overall health. I want to help those who are perhaps struggling, confused or generally unsure of what they should be doing in terms of food and exercise. I believe that today’s society poses an extreme amount of social and medial pressure on men and woman to be living and looking a certain way. Even for those very much involved within the health and fitness industry it can still be a very daunting, confusing and overwhelming place. Making positive change and helping like minded individuals live their happiest and healthiest life is now my primary aim and motivator within my work. What advice would you give to someone who has just started training for the first time/ or to someone who is getting back into exercise? Focus on you, do not compare yourself to anyone else. Concentrate on small positive change and personal improvements, rather than obsessing over the end goal or what others are achieving. It takes time, consistency and perseverance, keep going and do not give up! Remember to enjoy the journey and be proud of your achievements and improvements. Pick exercises/workouts that you enjoy and that make you feel good. Don’t pressure yourself into ridiculous workout routines which you do not enjoy, they will not be sustainable and therefore will not get long term results. Do not beat yourself up if you skip a workout or over indulged one weekend, as long as 80% of the time you’re staying on track, you will see results! Get yourself a personal trainer, they will teach you all the basics and kick start your fitness journey in the right way! Having a personal trainer to educate and motivate you at the start of your fitness journey will save you so much time, money and disappointment in the long run, I promise! Alternatively book yourself into small group classes or a Bootcamp, make yourself accountable, show up and work hard! What are your top 3 favourite healthy snacks? 1. Yoghurt and berries. I go for Alpro Coconut or Alpro Plain Protein yoghurt with a handful of raspberries/blueberries and a sprinkle of ground cinnamon. 2. Houmus (original rather than low fat – don’t believe all the labels you read) with carrot, cucumber and red pepper sticks. What advice would you give to someone who doesn’t have much time to cook? At the very least plan your meals and your shopping. Try to prepare any meals you will be eating out of the house i.e lunch for work. Keep it simple and try to mix in as many vegetables as possible into your meals. ‘Eat the rainbow’ as they say, the more variety of fruits and vegetables you adopt into your diet the better. My summer favourite at the minute is a quick and easy 10min veggie bowl including: raw baby spinach, raw red pepper, raw beetroot, a whole avocado mixed with pan fried (in coconut oil) mushrooms, halloumi and bacon. Add some black pepper and some chopped or ground garlic. If someone has just 20 minutes a day to exercise, what should they focus on? High intensity interval training (also referred to as HIIT). I usually go for a full body workout, selecting 5 exercises which hit both cardio and strength zones. I set my timer to 45secs exercise 15secs rest for 3 rounds, with a minute rest in between rounds. Short sharp and a very effective way of training when you are short on time! You don’t need to spend hours slogging it out in the gym to get results, implement 3, 20 minute HIIT workouts into your week along with a varied balanced diet and lots of walking and you will soon see results. What is your philosophy when it comes to keeping fit? We get one life and we are here to live it to the full! I strongly believe that by eliminating the restrictions, rules, guilt, punishments and all negativity surrounding food and fitness we are much better off and will see far more results in our everyday life. I think we are all in agreement that life is all about being healthy and happy! Therefore we should stop spending so much time comparing one another, judging, putting ourselves down etc and spend more time praising our achievements, loving our imperfections but above all enjoying life and looking after our bodies. TRAIN with Caitlin is all about empowering one another to be the best versions of ourselves that we can possibly be, cheering one another on and spreading positivity. Making exercise an accessible, sociable and enjoyable element of our everyday lives, enabling us to live our happiest and healthiest life.